A young woman from Nirmathas who is (as far as anyone can tell) a half-dragon. Aurora doesn't know who her parents were. An old dwarf named Sigrun took her in when she was a very young child and taught her how to survive in the woods, as well as the carpentry and smithing trade. When Sigrun finally passed away, she wandered a bit more before finally settling near Phaendar a relatively short period of time before the start of the campaign. 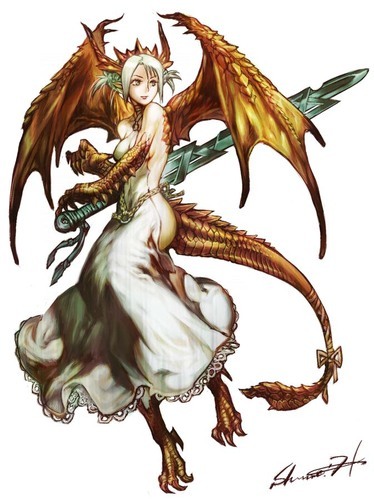 Aurora's gold dragon heritage shines through in her combination of Paladin fighting and smiting abilities and her Sorceror spellcasting. She prefers to wear heavy armor and fight with a greatsword, using her spells to buff herself and her allies or place her foes at a disadvantage.